Most companies that maintain a global workforce or regularly send employees overseas on special assignments offer a Cost Of Living Allowance (COLA). The purpose of a COLA is to partially offset the high cost of living overseas and maintain an employee’s purchasing power. Many COLA calculators simply apply a percentage adjustment between your current salary and the salary you would need to earn at the destination you are moving to, based on the overall cost of living. Simple calculators do not account your individual circumstances, family situation, or the value of any benefits that your employer may offer you. 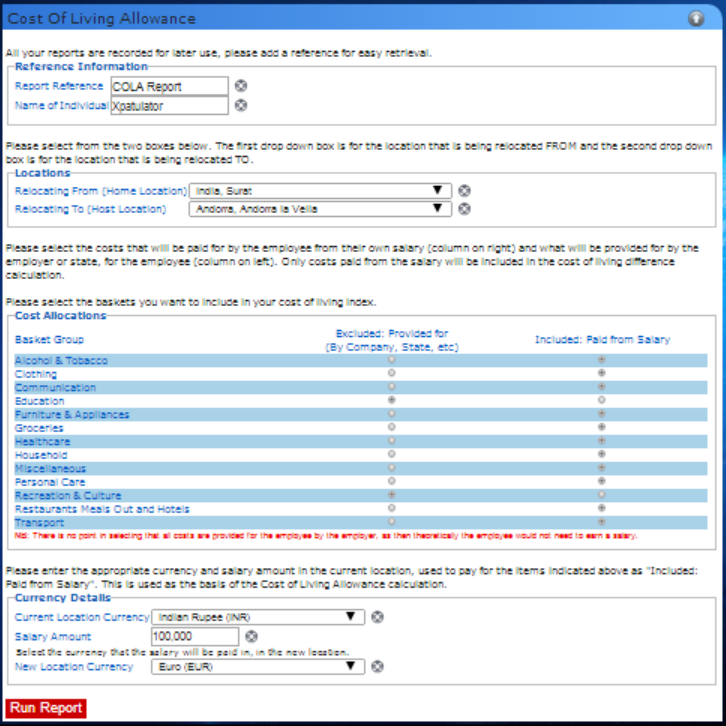 The Xpatulator COLA calculator allows you to run reports using many different scenarios. Depending on the benefits that are included in the offer, you can check to see what the affect will be on your actual purchasing power. The relative value of benefits such as housing and health care may far outweigh any disadvantages of your salary offer, such as accepting a compensation package tied to local pay rates. The COLA calculator uses the cost of approximately 200 goods and services grouped into 13 different baskets, such as education, groceries and transportation. The baskets are then weighted based on surveys of how expat workers actually spend their money. You can choose which baskets to include in your calculation and which baskets to exclude. You may wish to eliminate certain baskets from your calculation based on your lifestyle, family situation or the benefits that your employer is providing. You might eliminate tobacco and alcohol as a lifestyle choice, education because you do not have any school aged children or plan to homeschool and household because the company will be providing housing for you. By removing these baskets the weight will be shifted to the remaining baskets. The amount of COLA that you require to maintain your purchasing power will be based on the expenses that you will actually be responsible for. 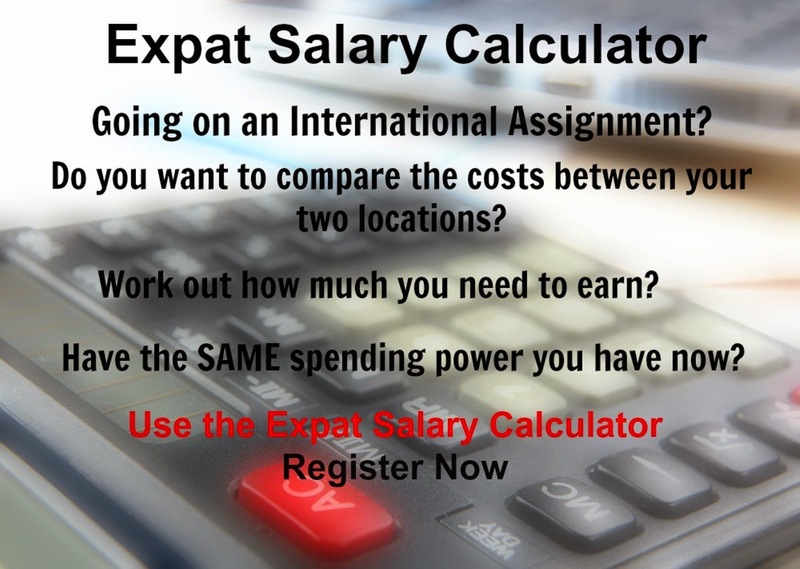 There are often costs of taking an overseas assignment that are more difficult to measure. Things like social freedom, personal safety and difficulties associated with not knowing the local language are broadly grouped as hardship. Xpatulator maintains a global hardship rating for over 700 destinations based on quality of life issues that foreign workers are likely to encounter. A relative difference in the hardship rating is used to add or subtract from your COLA calculation. For example, transferring from a home location in Atlanta, Georgia, which has a hardship rating of 10%, to Sao Paulo, Brazil, which has a hardship rating of 20%, would entail a 10% relative difference in hardship. 10% of your inputted salary would be added to your calculated COLA to account for the additional hardship of relocating from Atlanta to Sao Paulo. To accurately calculate your COLA needs, you should base your calculations on your net income, after taxes. Using the taxes you will be subject to at your host destination, determine how much COLA you will require to maintain the same after tax purchasing power at your host destination. You may need to contact tax advisers at home and abroad to confirm what your tax, withholding and tax return filing responsibilities will be. If you are receiving benefits such as housing, private education and transportation from your company, adjust your income accordingly. Deduct the money that you would normally spend on those items from the portion of your income you use to calculate your required COLA.